Thouth /Θουθ (Rosetta), Thouth /Θωυθ and Thout /Θωυτ; Thothis /Θῶθις (need ref) ? God of Documentation, Lord of Time, God of knowledge, maintaining the universe, arbitration of godly disputes, the arts of magic, the system of writing, the development of science, and the judgment of the dead. Wrote the divine book and book of magic. 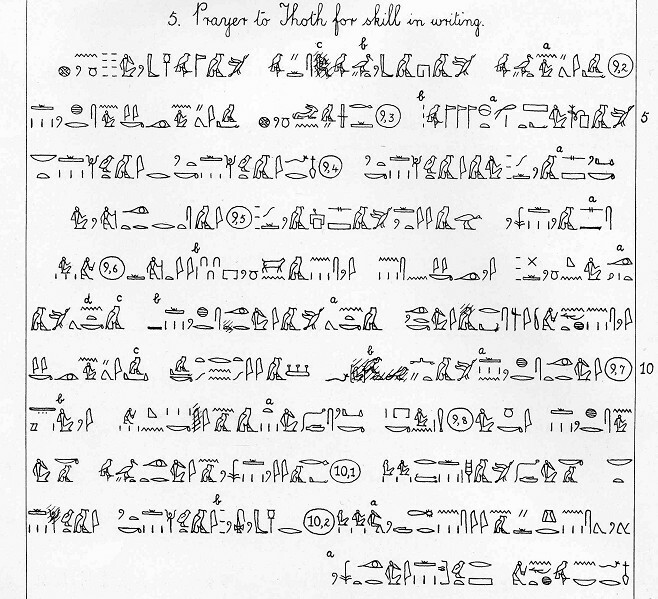 fnDy-- Fenedjy in Egyptian. Nick name for him it means Nosey, Long Nose, or Beaky. Thoth the great has come forth in justification, the left eye having united to the right, and the moon having arrived at the proper time. and watching over the words I utter. If only Djehuty would be near me tomorrow! and I go into the presence of the Lords of Righteousness. May I come forth vindicated! come, rescue me, a thoughtful man! but it is open to the thoughtful man. that he may discover the well for the hot-headed man. And you shall be filled. I am Thoth and I speak to you in the language of Rê anew, for it was spoken to you even before my words were heard. 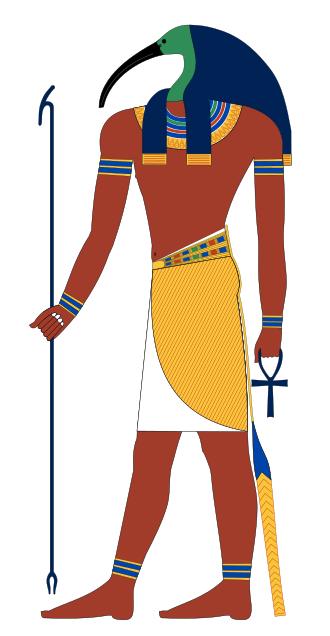 I am Thoth, lord of divine speech, He who sets things in their proper place. I render divine offerings to the Gods, invocation offerings to the Akhu. I am Thoth, He who grants Maat to the Ennead and all that comes from my mouth is made manifest, just as what issues from the mouth of Rê. I am he whom none can expel from heaven or earth, for I know what is hidden in the heavens, what is inaccessible on earth, hidden in the Nun. I am the creator of heaven, I am he who formed the mountains, I am he who creates the stream by means of thought, who creates the arms of the river, and when I bring forth the flood, I fertilize the fields, giving life unto Gods and men. who suffers thirst in the desert. and he is open for him who is silent. and providest sacrifices for the gods. by whom he was begotten. what he spoke was accomplished. do thou protect King Ptolemy, for he is Thoth, the Dweller in Hmnw. by whose deeds every god is appeased. Thou smitest the dwellers of the desert. Thou providest sacrifice for every god and goddess. Homage to the Lord of Hermopolis. What is this that thou givest me, thou fair one ? Thou causest me to see a darkness of thy making. The scribe of letters to the Ennead. and make me wise in your affairs. to form a distinguished man. and it is you who gave them wisdom. fate and good fortune are in your hand. O come to me that you may give me wisdom! offering them to your service. The service of the Lord of Power is perfection! And happy he who is allowed to follow it. ⲑⲱⲟⲩⲧ ⲡⲉ ⲟⲩⲛⲟⲩϯ `ⲛⲧⲉⲭⲏⲙⲓ. ⲛⲧⲟϥ ⲡⲉ ⲡⲓⲛⲟⲩϯ ⲛⲉⲙⲓ. ⲛⲉ ⲡⲓϯⲙⲓ `ⲛⲑⲱⲟⲩⲧ ⲡⲉ ϣⲙⲟⲩⲛⲉⲓⲛ.